Liverpool is one of the fastest growing cities in the UK – with a population of over 450 thousand and well on it’s way to passing he half a million mark. And although it might be famous as one of the industrial powerhouses of England, the home of “The Beatles” has become much more. The picture of a typical English worker town that most people have in their head is a bit too 1970’s to be true. We understand that and are here to help you out. In a busy city such as this you inevitably come to a moment when you need to hire a man with van. Perhaps you’re moving your company location or maybe you’re moving house. You can trust our reliable man and a van service in Liverpool for all your needs. We’re employing only highly trained professionals with very good driving skills and lots of experience in this field of work. We back them up with a qualified and responsive support team ready to guide you throughout the entire process of using our services. House removal – If you’re about to undertake a house removal, we can offer you high quality moving services transporting your household safely to your new home. You can trust us to transport your belongings from your old home to the new one. Office removal – Your business is changing location? No problem. Regardless if it’s office furniture or computers and tech items our teams are up to the challenge. Call us and we’ll arrange a secure and fast office move – because we understand that time IS money. Rubbish removal – Construction or renovation are difficult enough on their own. And there is always the inevitable problem of the junk removal. We offer rubbish clearance in a fast, professional and green manner regardless the site – office, home, commercial waste etc. Storage – Sometimes moving takes a bit longer than anticipated. This is why we offer our customers storage services in addition to our Liverpool man and van ones. We can offer you both short term and long term plans and you can be assured your belongings we’ll be handled and stored with utmost care. 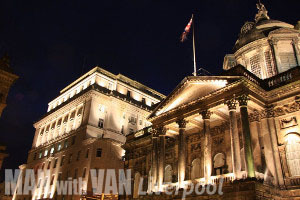 A port and a center of commerce throughout the ages, Liverpool is coming back to it’s roots. A bursting little metropolis, once again getting that cosmopolitan look that is appropriate for it. A center of not just manufacturing, but also trade, international business, culture and of course sports. Whether you’re born and raised Scouser or a newcomer to the city it’s very easy for you to be overwhelmed by it’s dynamic (and sometimes hectic) lifestyle. With our moving services you get fair pricing and top quality. We offer our customers flexibility according their needs and will customize your order and pricing to match them. On the fly change of service – a van & a man arrived and you suddenly realized they won’t be enough; no problem – call us and we’ll send another one as well. Enjoy our services anywhere in Liverpool – Allerton, Walton, Anfield, Canning, Sefton Park or Kensington or anywhere else, we’re prepared to service you fast and professionally. “Just perfect. Will use your man with van services again. Thank you.” – Jane S.
“Once the guys arrived and started loading my furniture I realized that one man with a van would just not do. Luckily all I needed was to give the guys from customer support a call and they sent another one in a snap.” – Richard G.